SAVE THE DATE - FR. 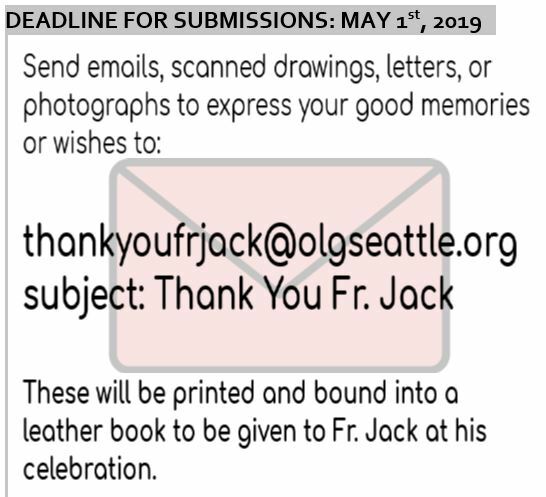 JACK&apos;S LAST MASS & RETIREMENT CELEBRATION! JUNE 30, 2019 | Beginning With 11:00AM Mass | Celebration to continue immediately following Mass, in THE WALMESLEY CENTER. Please come celebrate our 17 years as a community together with him! 2018 / 2019 Our Lady of Guadalupe School Registration NOW OPEN! I am writing you to share some thoughts about one of our largest ministries, our parish school. This ministry is something we all share in, whether we have children in the school or not, because the ministry of Catholic education is one of the ways we help to pass our Catholic faith on to the next generation, where we plant and nourish the seed of faith. Our school provides a beacon of love, light, and hope in an increasingly dark world. It helps parents form their children in the gospel values that Jesus proclaimed. They learn about the love of God and neighbor, in addition to math, science, literature, writing, art and music. They are formed as people for others not in the selfish me-first attitudes that are currently so much in the fore of our society. Catholic schools have a long and proud tradition in the US, dating back to 1882 when the American bishops, meeting in Baltimore, set about to create a nationwide system of parish schools to foster Catholic values that were then under attack in the political climate of that time. Our schools have evolved as times have changed, but they remain a place where the Gospel is proclaimed, and where children can grow in “age, wisdom, and grace” as scripture tells us Jesus did in Nazareth. I invite every parish family with school age children to consider our parish school as their school. Our Lady of Guadalupe is not a private school for the few, it is a parish school for all our parish family and for those in our broader community who desire it. Parents, Grandparents, Aunts and Uncles, come and learn about our school. Make it known to the special children in your lives. Our school is pleased to offer tours to interested families; our principal Anton Kramer is ready to meet with you. Our school is now enrolling grades K-8 for the Fall term, as well as enrolling younger children in the expanded Early Learning Center that opens in September. Observing our parish church on Easter Sunday brought me great joy. It was filled with the people of God, people of all ages, backgrounds and circumstances. But I was especially struck by the number of young families and the great number of children in our midst. We are so glad to have you among us! Bring these children to our parish school and help us to continue to develop a relevant, vibrant community, building on the vision and sacrifice of those who came before us. ONLINE www.olgseattle.org - create a profile, add a transaction, under "Sunday Collections" put the amount you wish to donate in the Sunday Collection, under Sunday Giving Contributions. Set date donation Start Date to 1/1/2018 & End date to 12/31/2018. IN PERSON: Come to the Pastoral Center and fill out your card and turn it in there. U.S.MAIL : Call or email Peggy Behnken at the Pastoral Center to have a card sent to your house for you to fill out and return.